If you are having difficulties of purchasing merchandise in Korea or want to purchase the merchandise from a site that does not support overseas delivery, momokorea can help you. We support buying service for both online and offline. Momokorea is handling Korean goods through our "Direct shop". 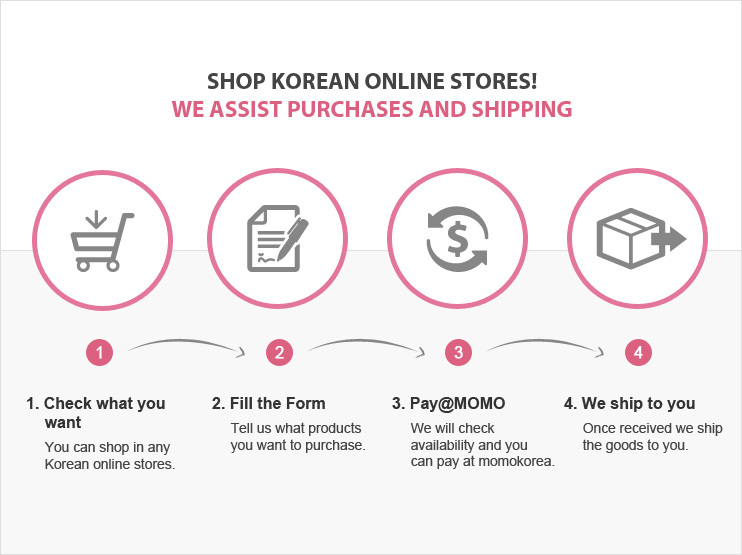 Customers can shop directly through Momokorea without sending 'assisted purchasing form'. If there is no product what you are searching for in our direct shop, please use our assisted purchasing service. 1. Fill out the [Assisted purchase form]. After you select the merchandise you want, fill out our form and click the [send] button. If you want to add more products, please click [add more products]. 2. Settle the purchase at Momokorea directly. We will check if the product is available and send you the URL in which you can settle the transaction. If you click the URL we sent, you can pay with PayPal or credit card. The quoted price does not include the delivery cost, and it would be added when you select the delivered country. Please click here to find more details of delivery cost. After you order an item, it takes 2-3 business days to deliver for domestic shipping(in Korea). The handling time may be longer if there is the national holiday, natural disaster or stock problem of the store. When we receive the product, it will send it to you via the selected delivery method (Small Packet, EMS or DHL). The duration of international delivery depends on the delivery method. You can track the delivery status from momokorea. 1. We suggest the best price. We can purchase from the URL you chose, but we also propose the lowest price of the merchandise among the Korean sites and send you the quotation. Of course, it is the same merchandise that you want to buy and from the most reliable sites. We can check if it is available at an offline store and buy it for you if you have detailed information such as the item number. You may inquire it to Momokorea by attaching its image in the [Assisted purchase form]. We will check if the merchandise arrived is the same as what you ordered in quantity, color, etc. If the merchandise does not match your order, we will return it free of charge. We will let you know the wrong delivery by e-maill, process will be delayed for 3-5 days to exchange goods. If you buy multiple items, we will repackage them to minimize the delivery cost. The following packages cannot be consolidated. Packages that have been in the storehouse for over 30 days after arrival. Packages that are deemed too fragile or unfit due to their shape. Momokorea charges the delivery cost according to the country, weight, volume and delivery method. You can use the shipping calculator to check the expected delivery cost before you actually pay for your purchase.